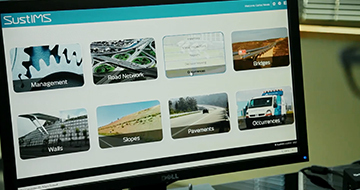 The SustIMS system developed by Ascendi, in collaboration with Minho and Nova Lisboa Universities, was awarded today with one of the Global Road Achievement Awards (GRAA) – 2017, a worldwide initiative of the International Road Federation (IRF), to promote innovation in the road sector. The IRF – International Road Federation is a global not-for-profit organization, headquartered in Washington DC (USA) since 1948, which supports a large network of public and private associated entities in more than 70 countries, providing them with qualified sources of knowledge, counselling and training programs, in order to disseminate best practices and industrial solutions in the road sector. The Global Road Achievement Awards (GRAA) is today one of the world’s most prestigious road industry awards, aiming to promote global recognition of projects that place the road sector at the forefront of worldwide social and economic development. The award distinguishes SustIMS as the best worldwide project under the “Asset Preservation & Maintenance Management” category, being recognized for its “excellence, innovation and societal impacts” characteristics. Know more about the SustIMS platform here.